Not gonna lie, when it comes to bookish places to go Medina, Ohio is heaven. 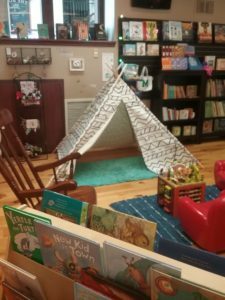 I’ve previously talked about Project Learn’s Bookshelf used stores, but Medina has another really great little treasure to check out as well. That is The Book Store, a little indie bookstore right off of Medina’s historic Square. Now we all love indie bookstores but how many double as a real world bookish etsy store? 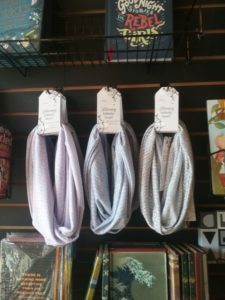 Not only does The Book Store sell books but it also sells all kinds of bookish merchandise, much of it from local Ohio artisans! What kind of bookish merch are we talking? Scarves, pillows, candles, prints, jewelry, mugs, and much more! This place has it all! I have my eye on a fabulous Sherlock Holmes inspired book scarf, several bracelets, and a mug or two from this place. We even found a couple of beautiful Sarah J Maas prints that we absolutely had to get. Like Harry Potter? Heck, you’re in luck. This place is teaming with Potter stuff. House scarves and hats (all 4 houses), pillows, candles from Frostbeard Studios, and every Potter related book under the sun. Even some of the cutes little Harry Potter related magnetic bookmarks I’ve ever seen. The building itself is absolutely gorgeous inside. Though not very big you can easily spend upwards of 30 minutes in here just browsing all the fabulous items and looking at the inside of the store. It is arranged with plenty of space to move around and you never feel cramped. The store smells great too. You’ll also find just general nerdy things inside. The owner of this store is so friendly and happy to help with any questions you may have. She’s one of the coolest local store owners in the area, completely involved in book nerd life. She’s great to talk to and open to ideas and new products. That alone would keep me going in. Have young kids? There’s a great little kids section in the store. There’s toys, a tent, little places to sit. Just a generally great place for the kids to hang out while their parents are looking at their own things. If this place had existed when I was little I would have crawled into this tent with a book and been good to go. 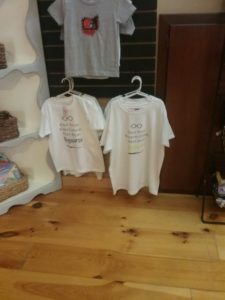 The Book Store also has an online store and features its artisans on its website with links to their own stores as well. you can check them out here. 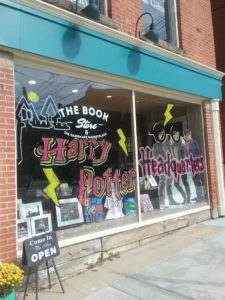 I highly recommend checking out this store if you’re in the Akron/Medina area, between it and The Bookshelf stores, Medina is the best place to be a book nerd. I wish I could go there more often. 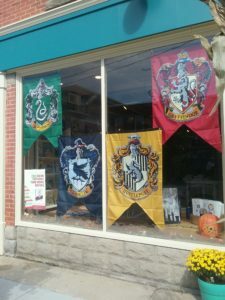 What is your favorite local bookish haunt? Share in the comments.